امیرامجدی, مژگان, محب الحجه, علیرضا, میرزایی, محمد. (1393). عدم قطعیت در تعیین امواج گرانی لختی در یک بررسی موردی روی ایران. مجله ژئوفیزیک ایران, 8(1), 13-32. مژگان امیرامجدی; علیرضا محب الحجه; محمد میرزایی. "عدم قطعیت در تعیین امواج گرانی لختی در یک بررسی موردی روی ایران". مجله ژئوفیزیک ایران, 8, 1, 1393, 13-32. امیرامجدی, مژگان, محب الحجه, علیرضا, میرزایی, محمد. (1393). 'عدم قطعیت در تعیین امواج گرانی لختی در یک بررسی موردی روی ایران', مجله ژئوفیزیک ایران, 8(1), pp. 13-32. امیرامجدی, مژگان, محب الحجه, علیرضا, میرزایی, محمد. عدم قطعیت در تعیین امواج گرانی لختی در یک بررسی موردی روی ایران. 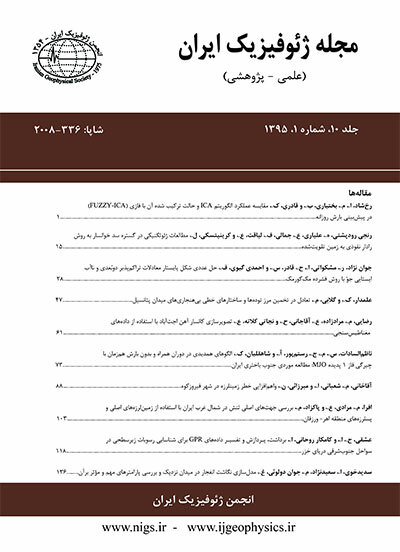 مجله ژئوفیزیک ایران, 1393; 8(1): 13-32. چهار ایستگاه جو بالای کشور در تاریخ 7 تا 9 فوریه 2012 ، به دنبال مشاهده نشانه هایی از فعالیت موج گرانی لختی هستند. گرانی لختی با اثر غالب شناوری که به طور عمده بسامد زیادی دارد ناتوان است. A fluid, which is stable under the action of buoyancy, can oscillate under the influence of buoyancy and Coriolis forces. The resulting ageostrophic oscillations with a frequency between Coriolis and buoyancy frequencies are called inertia–gravity waves, abbreviated as IGWs, hereafter. Typically, the phase speeds of IGWs are 15 to 35 ms-1, their vertical wavelengths are 500 m to 15 km and their horizontal wavelengths are 50 to 1000 km. This study is concerned with uncertainties in two common methods to study IGWs: the hodograph method and the method that uses the horizontal divergence field to estimate the wave characteristics. To this end, a noticeable IGW event that occurred during 7 to 9 February 2012 over Iran was investigated. This event was accompanied by the passage of a synoptic system and a noticeable amount of precipitation. Moreover, this IGW event was simulated with the Weather Research and Forecasting (WRF) mesoscale model using the NCEP FNL (final analyses) data for 72 hours, from 12UTC 6 February until 12UTC 9 February. The setup of the model included a horizontal resolution of 25km, 35 levels in the vertical direction with a model top of 10 hPa (~30 km) and a time step of 150 s.
The wave properties such as wave frequency and period, intrinsic phase speed, group velocity and horizontal and vertical wavelengths obtained based on the horizontal divergence field as the main determining quantity were investigated. This is possible, because the procedure avoids an explicit treatment of the background field, which has a zero divergence, and is applicable to waves of an arbitrary wavelength. Observational data were obtained from radio soundings launched from four upper-air stations on the above dates. Previous studies have shown that the presence of IGWs leads to perturbations in temperature and wind fields. Therefore, IGWs structures can be identified by the fluctuations which are obtained after subtracting the background flow. The preliminary analysis of the observational data gives a typical vertical wavelength of 0.5-6 km. Subtraction is performed either by fitting a polynomial of sixth degree or applying a high-pass filter to suppress perturbations with scales larger than 6 km. Vertical wind and temperature profiles obtained from the observational data as well as a numerical simulation were plotted and compared against each other at the same time and the same location. The results showed that the simulated data were smoother and more homogeneous than the observed data, because the IGW amplitude was damped by the explicit and implicit diffusion of the numerical model. Nevertheless, with a medium resolution, the wave characteristics estimated from the horizontal divergence field were satisfactory. An estimation of the wave properties showed that a high-frequency wave with was emitted in this case. The quantity was an estimate for the wave frequency scaled by the inertial frequency. For the observed data, hodographs were plotted for that part of stratospheric and tropospheric wind profiles with maximum wave activity. This method had an acceptable performance in the assessment of the qualitative features of the wave. However, a great uncertainty appeared in the quantitative characteristics of the observed IGWs. Uncertainties are greater when a polynomial fitting was used in separating perturbation from the mean field, as it sometimes created overshoots. On the other hand, filters often damped the wave amplitudes. In addition to the sensitivity of the background removal, some of the information was out of reach because of the superposition of either multiple waves or a wave packet with its reflection as shown by Zhang et al. (2004). Intrinsic frequencies determined by this method were typically close to the Coriolis frequency. This study, like other previous studies (Plogounven et al., 2003; Zhang et al., 2004; Guest et al., 2000; Lue and Kuo, 2012) suggests that the nature of the hodograph method is only able to detect the low-frequency part of the IGW spectra. Considering the limitations and uncertainties of the hodograph method, it should be used in conjunction with other methods such as those based on the horizontal divergence field, Stokes parameters and radar observations. امیرامجدی، م.، محب‌الحجه، ع. ر.، میرزائی، م.، ۱۳۹3، شبیه‌سازی عددی امواج گرانی– لختی با استفاده از مدل WRF روی ایران: بررسی موردی: مجله فیزیک زمین و فضا (زیر چاپ). Alexander, M. J., and Holton, J. R., 2004, On the spectrum of vertically propagating gravity waves generated by a transient heat source: Atmos. Chem. Phys., 4, 923–932. Andrews, D. G., Holton J. R., and Leovy, C. B., 1987, Middle Atmosphere Dynamics: International Geophysics Series, 40, Academic Press, 489 pp. Bosart, L. F., and Bracken, W. E., and Seimon, A., 1998, A study of cyclone mesoscale structure with emphasis on a large-amplitude inertia–gravity wave: Mon. Wea. Rev., 126, 1497–1527. Charron, M., and Manzini, E., 2002, Gravity waves from fronts: Parameterization and middle atmosphere response in a general circulation model: J. Atmos. Sci., 59, 923–941. Choi, Y. G., Lee, S. C., McDonald, A. J., and Hooper, D. A., 2006, Wind-profiler observations of gravity waves produced by convection at mid-latitudes: Atmos. Chem. Phys., 6, 2825-2836. Dhaka, S. K., Bhatnagar, R., Shibagaki Y., Hashiguchi, H., Fukao, Kozu, S. T., and Panwar, V., 2011, Gravity waves generated in a convective and a non-convective environment: Ann. Geophys., 29, 2259–2276. Guest, F. M., Reeder, M. J., Marks, C. J., and Karoly, D. J., 2000, Inertia–gravity waves observed in the lower stratosphere over Macquarie Island: J. Atmos. Sci., 57, 737–752. Hamming, R. W., 1989, Digital Filters: 3D ed. Prentice-Hall. Koch, S. E., and Dorian, P. B., 1988, A mesoscale gravity wave event observed during CCOPE. Part III: Wave environment and probable source mechanisms: Mon. Wea. Rev., 116, 2570-2592. Lue, H. Y., and Kuo, F. S., 2012, Comparative studies of methods of obtaining AGW's propagation properties: Ann. Geophys., 30, 557-570. Plougonven, R., and Zhang, F., 2007, On the forcing of inertia–gravity waves by synoptic-scale flows: J. Atmos. Sci., 64, 1737–1742. Plougonven, R., Teitelbaum, H., and Zeitlin, V., 2003, Inertia–gravity wave generation by the tropospheric midlatitude jet as given by the Fronts and Atlantic Storm-Track Experiment radio soundings: J. Geophys. Res., 108, 4686. Scavuzzo, C. M., Lamfri, M. A., Teitelbaum, H., and Lott, F., 1998, A study of the low-frequency inertio–gravity waves observed during the Pyrenees Experiment: J. Geophys. Res., 103, 1747–1758. Uccellini, L. W., and Koch, S. E., 1987, The synoptic setting and possible source mechanisms for mesoscale gravity wave events: Mon. Wea. Rev., 115, 721–729. Zhang, F., and Koch, S., 2000, Numerical simulations of a gravity wave event over CCOPE. Part II: Waves generated by an orographic density current: Mon. Wea. Rev., 128(8, Part 1), 2777-2796. Zhang, F., Wang, S., and Plougonven, R., 2004, Uncertainties in using the hodograph method to retrieve gravity wave characteristics from individual soundings: Geophys. Res. Lett., 31, L11110. Zülicke, C., and Peters, D. H. W., 2006, Simulation of inertia–gravity waves in a poleward breaking Rossby wave: J. Atmos. Sci., 63(12), 3253 – 3276.